All research is rooted in a simple question about something specific. For Allan Munck, that question was: Where do glucocorticoids act? Spurred by intellectual curiosity when he set out to understand how glucocorticoids worked, he didn’t anticipate answering that question would be the beginning of a prolific career spanning more than five decades. The central function of glucocorticoids is to protect against stress—they bind to receptors present in nearly every cell in our bodies and play a key role in regulating the immune system. A world-renown researcher in the field of endocrinology, and considered by many to be the father of glucocorticoid receptors, which he discovered in the 1960s, Allan U. Munck, PhD, an active emeritus professor of physiology and neurobiology at the Geisel School of Medicine died unexpectedly on April 29. He was 90 years old. Known for his “intellectual honesty, collegiality, and thoughtful mentoring,” Munck was a remarkable man who left an incredible and indelible legacy here at Dartmouth, says Duane Compton, interim dean. Upon his retirement in 2000, Geisel (Dartmouth Medical School at the time) hosted a symposium, “Glucocorticoids and Beyond” honoring Munck for his contributions to the field, and established a lectureship in his name. More recently, with his blessing, Munck’s legacy will continue to live on through the Annual Munck-Pfefferkorn Prize Lecture. This fall, the inaugural Munck-Pfefferkorn Lecture will be delivered by Nobel Laureate Thomas C. Südhof, a neuroscientist known for his work in synaptic transmission. 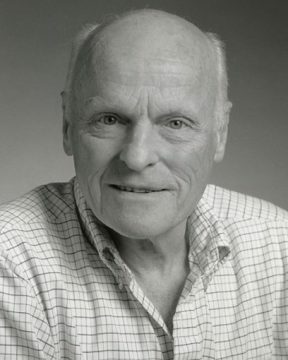 Donald Bartlett Jr., MD, active emeritus professor of physiology and neurobiology at Geisel says of his former colleague and professor, “I met Allan as a first-year medical student—it was his first year on the faculty and he taught the entire endocrinology section of the physiology course. It was only toward the end of the year that we learned he had never taken an endocrinology course, and apart from the steroid hormones, he learned most of the material a few days before we did. 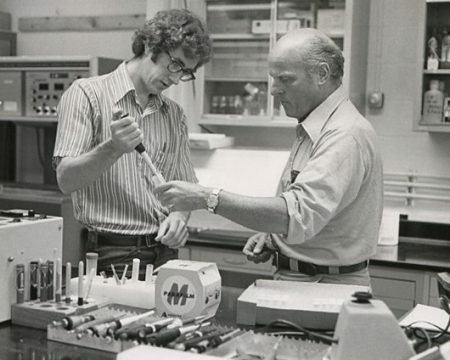 Allan Munck (R) in the lab with Gerald Crabtree. Charles Wira, PhD, a professor of physiology and neurobiology, had been friends with Munck for more than 50 years; they met in 1965 when Wira entered the PhD program at Dartmouth. “Despite the fact that I had no plan to do my PhD thesis research with him, I selected Allan as my advisor—it was one of the best decisions of my life,” he says. Among Munck’s longtime physiology and neurobiology colleagues who portray him as a wonderful mentor and imaginative scientist, Aniko Fejes-Toth, MD, considers herself lucky to be amid the scientists who “grew up” in his lab. “I was working in Hungary when I met Allan in the late 1970s at a scientific symposium,” Fejes-Toth recalls. “Later, in 1982, he invited me to join his lab as a visiting scientist.” An invitation that changed her life she says, “My husband and I came to Dartmouth for one year and stayed forever. 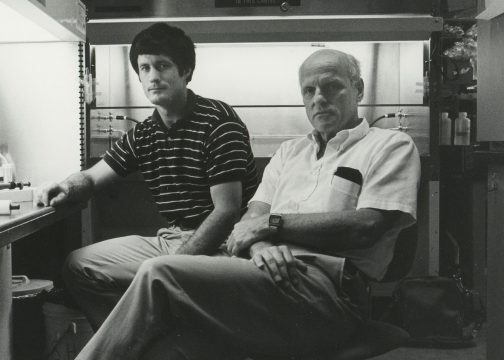 Paul Guyre (L) with Allan Munck (R) in 1984. When Val Galton’s husband accepted a position in the Pathology Department in 1960, he did so with an understanding that his wife would also be accommodated. Galton, now a professor of physiology and neurobiology, recalls paying a visit to Munck in his lab in the old Medical North building on College Street where she was impressed with both his work and his enthusiasm. During the 54 years that Galton had known Munck, she says he had consistently been there for her on both a scientific and personal level. He was always amiable, and above all kind to everyone. A lifelong teacher and student with a voracious appetite for knowledge, Munck was well-known for his prolific and detailed note-taking, his delight in the wonderment of all things in the world, his love of deep conversation and analysis, and his boundless curiosity about what motivated people. Dedicated to fitness and health, Munck was an avid biker, runner, hiker, squash player, and skier. He could regularly be seen running on Hanover’s streets, wooded trails, or at Leverone field house up until his death. Also an accomplished cellist and connoisseur of classical music, Munck practiced daily and played in chamber groups twice weekly throughout his retirement. He leaves his wife, Claire, two children, and three grandchildren. A celebration of Allan Munck’s life is being planned for later this summer.